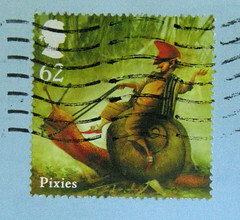 Already 2014 is a fine mail year. I've spent a good chunk of my free time writing, and have received some spectacular mail in return. 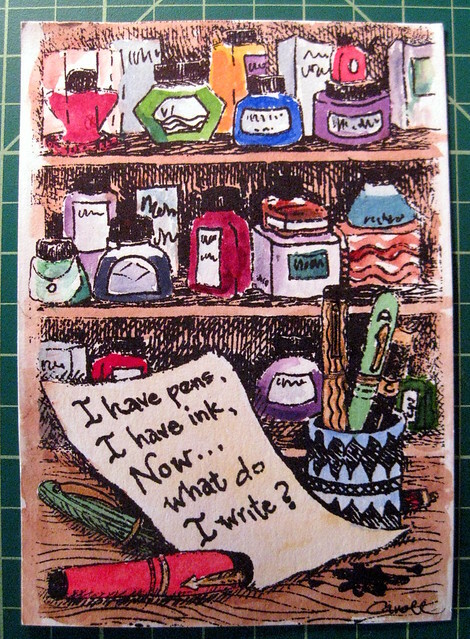 Above, a handmade gocco postcard from the fabulous Carroll, whose mail art and artwork always just astounds me. This postcard is going up on my bulletin board right above my writing desk! Have a look at her own photo of this artwork, which she sketched from her ink storage shelf. 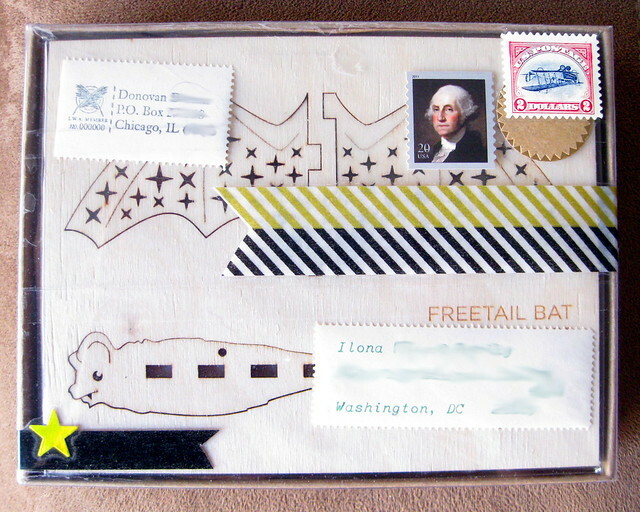 Next up, brilliant bat mail from Donovan of the Letter Writers Alliance. Wow, does she ever know me, and is she generous, or what? It's a light wooden bat ornament, which is probably also going to somehow fly from my writing desk bulletin board. It came beautifully and soundly packaged, and I was able to preserve that loveliness with some fancy fingerwork with my special craft knife, which I had to use to open it. I love mail challenges! Finally, I have acquired a new pen pal. 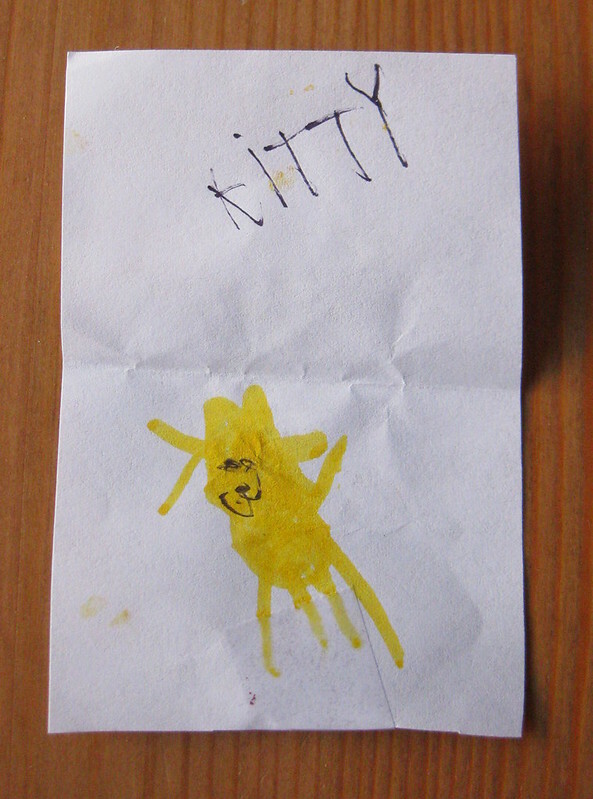 Normally my pen pal roster is closed, but the 3-year-old 4-and-a-half-year-old son of my dear first cousin wrote to me. He actually wrote me FIRST, out of the blue, and I haven't even seen this fine young fellow in more than a year. So of course I wrote back, and he's now written me a couple of times, most speedily - and he always mentions cats (which just wins me over even further). Here is one of his annotated illustrations from his latest missive. And now... off to write some letters! Wow, that is so awesome mail indeed! I haven't been in much of a writing mood so haven't sent or received much mail as of late. Today is publication day for "Revolutionary!" Revolutionary, in less than a week!